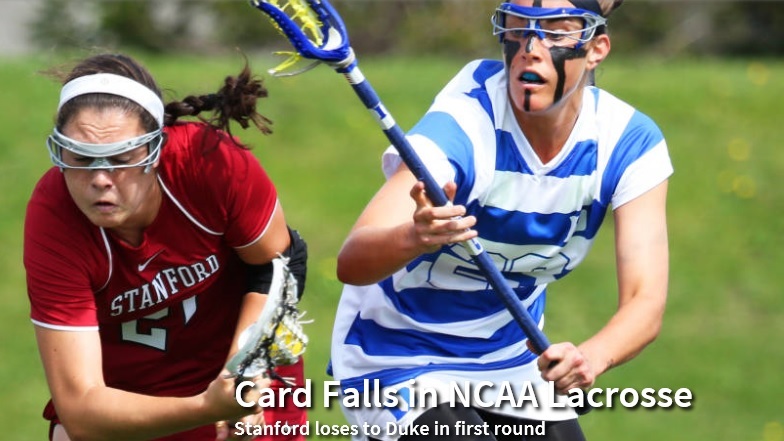 Stanford fell into a hole early and never fully recovered during a 13-8 loss to Duke in the first round of the NCAA women’s lacrosse tournament on Friday at Notre Dame. No. 19-ranked Stanford (14-5) allowed three goals in the first 59 seconds and didn’t earn its first possession until the Cardinal trailed 3-0. However, Stanford rallied to within a goal and was within two in the final minutes before No. 9 Duke (10-7) essentially scored three empty-net goals in the final two minutes for the closer-than-the-score-indicates final margin. “You’ve got to be ready from the first draw and that happened to us in the past two games,” said Stanford coach Amy Bokker, whose team fell behind Denver 6-0 in a 14-11 loss in the Mountain Pacific Sports Federation tournament final last week. Alexandra Crerend led Stanford with three goals and five draw controls – both season-highs for the sophomore transfer from Brown. It was her first multi-goal game for Stanford. Stanford closed to within 4-3 after consecutive goals by Crerend and Meg Lentz, the latter after a quick pass into the middle from Hannah Farr on a free position, with 6:14 left in the first half. With Stanford a player up because of a Duke yellow card, the opportunity seemed there to tie the game. Farr did get a shot off during the penalty, but the Blue Devils countered with two shorthanded goals to bolt to a 6-3 lead. Stanford was forced to chase thereafter. Needing to put consecutive goals together to truly rally, Stanford was unable to do so, though the Cardinal continued to apply the pressure. However, they continued to have trouble cracking the interior of the Duke defense. Crerend scored twice in a three-minute span of the second half to bring Stanford within 7-5 and the teams continued to trade goals as the clock wound down. With 8:51 left, freshman Kelsey Murray made a run from behind the Duke goal, cut across the middle, and fired a shot over the shoulder of Duke goalie Kelsey Duryea to cut the Stanford deficit to 10-8, but the Cardinal would draw no closer. Duke began to stall, spreading the field and drawing the Stanford defense out. Stanford appeared to concede a goal to in an effort to gain possession off the faceoff. With 1:57 left, Stanford sophomore goalie Katie Wiseman, making her first collegiate start, left the crease to guard a Blue Devil on the wing. Duke indeed scored, but Stanford failed to control the draw and Duke added two official empty-net goals, after Wiseman left the field. The CAL Bears host the Stanford Cardinal in the 50th Big Game. This rivalry goes back to 1964 the year CAL men’s lacrosse was founded. Stanford leads early in the game before Cal has a huge second quarter. In the third Stanford battles back and pulls to within 1 goal at 10-9. Cal dominates the fourth and wins 15-12. 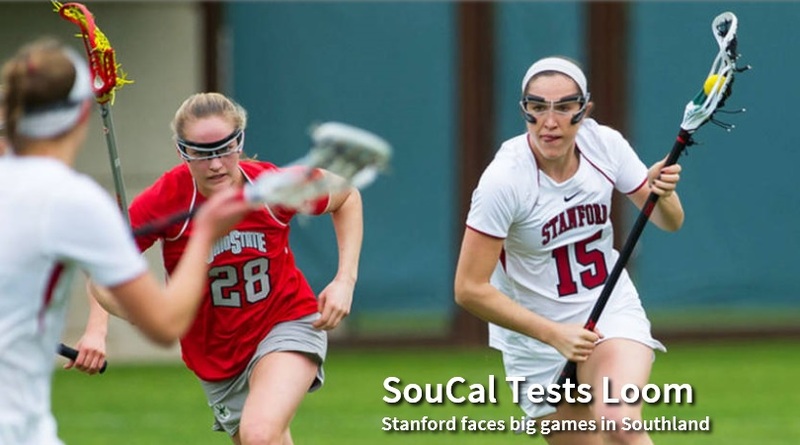 The Stanford women’s lacrosse team received an at-large bid to the NCAA tournament Sunday night. It was welcome news after losing the chance at automatic berth earlier in the day. 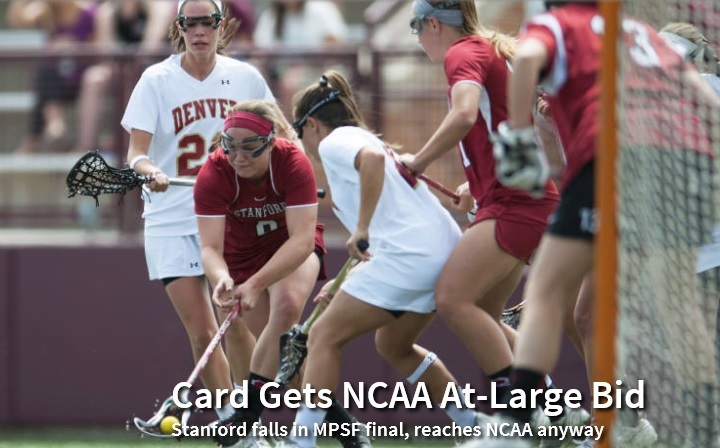 Stanford fell into hole early and could not recover in a 14-11 loss to Denver in the Mountain Pacific Sports Federation tournament championship game Sunday. However, Stanford (14-4) secured an NCAA spot for the second consecutive year. Stanford plays Duke (9-7) in the first round on Friday at Notre Dame. Stanford would play the winner of High Point (14-5) and Notre Dame (9-8), the No. 8 seed, in the second round of the 26-team tournament. Last year, Stanford beat Notre Dame in the first round for the first NCAA victory in school history. In the MPSF final, No. 20 Stanford (14-4) fell behind by deficits of 5-0 and 9-2 and never was able to draw closer than the final margin. Hannah Farr and Rachel Ozer scored three goals apiece to lead the Cardinal. Denver (18-1) plays Jacksonville (14-5) in Gainesville, Fla.
Stanford had played Denver six times in the MPSF tournament, including five times in MPSF tournament, and won every one. But Denver (18-1) ended that streak thanks largely to its fine start. This was in contrast to their previous meeting, on April 4 at Stanford, when Stanford bolted a 6-0 lead in what would be a 13-12 Denver victory. Ozer broke through for Stanford in the ninth minute. From that point on, Stanford outscored Denver, 11-9. Alexandra Crerend helped give the Cardinal a boost on faceoffs, which helped fuel a 3-0 run that brought Stanford within 9-5, on a goal by Lucy Dikeou with 1:21 left in the first half. Denver, however, responded with a 3-0 run of its own bridging halftime to retake control of the game. University of Denver seniors Jenn Etzel (Bel Air, Md.) and Meredith Harris (Middleburg, Va.) led the Pioneers with a combined 15 points, as DU upended Oregon 18-9 in the MPSF Semifinals on Friday afternoon. With the win, the Pioneers advance to the MPSF Championship for the second-consecutive year and sixth time in school history. Kyle Fraser scored six goals — one off the school record — to lead Stanford to a 15-6 victory over Colorado and a berth in the Mountain Pacific Sports Federation women’s lacrosse championship game. Denver is 1-0 against Colorado with a 15-4 victory at home earlier this year on Feb. 19. The Buffs are in their inaugural year of Division I women’s lacrosse. DU is 0-6 all-time against Stanford in the MPSF Tournament with five of those losses coming in the MPSF Championship game. Of Denver’s five championship appearances, four of the Pioneers’ losses have come by a single goal, including last year’s 7-6 loss on May 4, 2013 in Eugene, Ore. Additionally, Denver and Stanford the last time DU hosted the MPSF Tournament in 2010, with the Pioneers falling 11-10 in double-overtime on a sudden victory goal. The winner of the MPSF Tournament will earn an automatic berth in the NCAA Tournament. Selections for the NCAA Tournament will be announced Sunday at 7 p.m. MT. 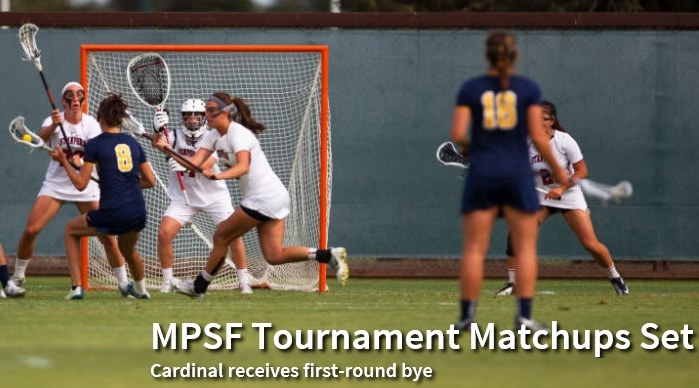 Stanford has received a first-round bye in the Mountain Pacific Sports Federation women’s lacrosse tournament and will open play Friday in the semifinals in Denver. Stanford (13-3 overall, 7-2 MPSF) completed its regular season with an 18-7 victory over California on Thursday, but needed a loss by Oregon in either of the Ducks’ final two games to receive a first-round bye in the six-team conference event. The Ducks obliged Friday, with an 11-5 loss to first-place Denver, ensuring that the winning Pioneers will receive the No. 1 seed at home. Oregon lost again on Sunday, to Colorado, 10-9, finalizing the seeding. Stanford has won eight of the past nine MPSF tournament titles. The tournament winner earns an automatic berth in the NCAA tournament. Game 1: No. 3 Colorado (10-7) vs. No. 6 San Diego State (7-9), 3 p.m.
Game 2: No. 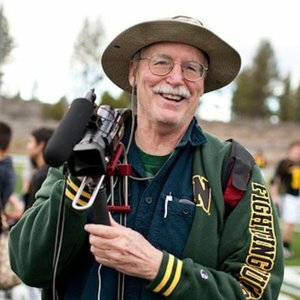 4 Oregon (10-7) vs. No. 5 USC (9-8), 6 p.m.
Game 3: No. 1 Denver vs. Game 2 winner, 3 p.m.
Game 4: No. 2 Stanford vs. Game 1 winner, 6 p.m.
Championship: Semifinal winners, 10 a.m.
Stanford faces a challenging weekend as it seeks to secure a No. 2 seed and a first-round bye for the Mountain Pacific Sports Federation tournament. The Cardinal must do so against two of the MPSF’s up-and-coming programs, third-year SDSU and second-year USC. Stanford (11-2 overall, 5-1 MPSF) is alive for the No. 1 seed, but would need two Denver losses in two games for that to happen. Week in Review: Stanford is coming off an 18-6 victory over visiting UC Davis. It was the third consecutive victory by at least eight goals by Stanford. The UC Davis contest was the first of three in a six-day period that continues in San Diego and USC. Against UC Davis, eight Stanford players scored two goals apiece to lead the Cardinal attack. The Cardinal built an 8-1 lead in the first 12 minutes. Season in Review: Stanford returned 11 starters and 96 percent of its goals from last year’s team that advanced to the second round of the NCAA tournament for the first time in school history. Stanford has played three teams that were ranked in the Top 20 at the time of their contests and went 3-0 in those games. On March 29, Stanford beat No. 6 Notre Dame, 11-10. The Cardinal rallied from a 9-6 second-half deficit with a 4-0 run. Lucy Dikeou sliced through the defense for the winner with 4:05 left. Megan Lerner drew a charge with 17 seconds left to preserve the win. The other games were back-to-back comeback road overtime victories at No. 11 Towson, 8-7, and No. 14 Georgetown, 11-10, on March 7 and 9. Friday’s Opponent, San Diego State: The Aztecs are in sixth place, occupying the final spot in the MPSF tournament. San Diego State (6-7, 3-3) is coming off a pair of narrow road losses last weekend, losing to MPSF leader Denver, 12-11, allowing two goals in the final 21 seconds, including the winner with two seconds left. The Aztecs followed with a 7-6 sudden-victory overtime loss at Colorado. 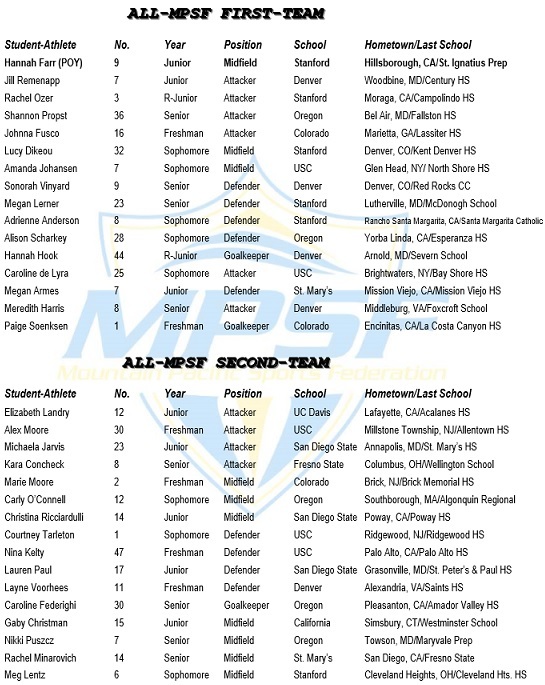 Christina Ricciardulli is the reigning MPSF Defensive Player of the Week. She caused six Denver turnovers, had five draw controls and four groundballs. Against Colorado, she scored with 55 seconds left to force overtime. Michaela Jarvis has a team-leading 34 points, on 18 goals and 16 assists. The Stanford-SDSU Series: Stanford leads the all-time series, 2-0, with both games being played at Stanford. This will be their first meeting on Montezuma Mesa. Their most recent meeting, a 23-16 victory on April 21, 2013, is notable because it tied Stanford’s single-game record for goals scored. Rachel Ozer scored four goals, and Hannah Farr, Julia Burns, and Lucy Dikeou scored three apiece. The 23 goals tied the Cardinal’s total in a 23-8 victory over Catholic on March 26, 1998. Stanford beat SDSU, 17-11, in their first meeting, in 2012. Sunday’s Opponent, USC: The Trojans (7-6, 5-2) come into the weekend, which begins with a Friday game against visiting Oregon, with a chance to vault all the way to the No. 2 seed for the MPSF tournament. If USC beats the MPSF’s second- and third-place teams in its final two regular-season games, the Trojans will clinch third. And, if Colorado loses at least one of its two remaining conference games (against visiting California and at Oregon), then USC can jump to second and earn a bye into MPSF semifinals. Perhaps topportunity is not surprising for the second-year program. 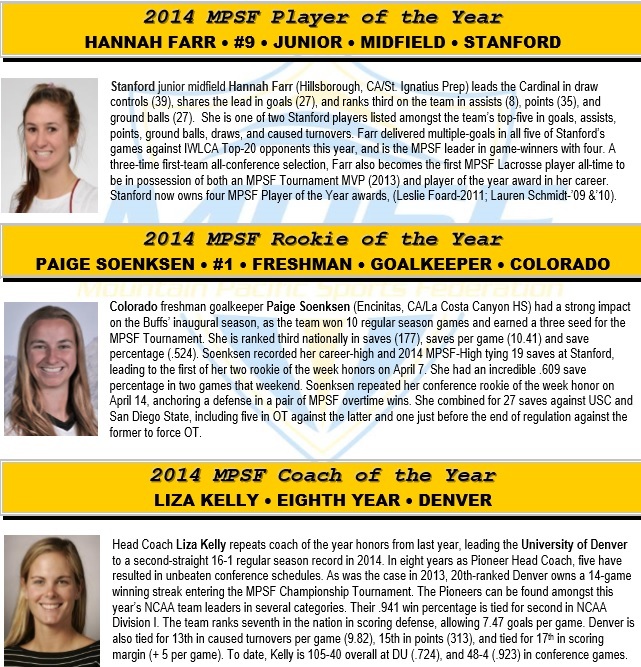 USC, after all, was the preseason coaches’ choice to finish third in the MPSF, and even received a first-place vote. The Stanford-USC Series: The teams have played once, with Stanford earning a 17-11 home victory on March 8, 2013. Anna Kim and Julia Burns scored four goals apiece for the Cardinal.